Being totally smitten with this bold floral linen, purchased within the past year, I have had my heart set on making it into a day dress this Summer. Big, bright daisies with lavender centers. 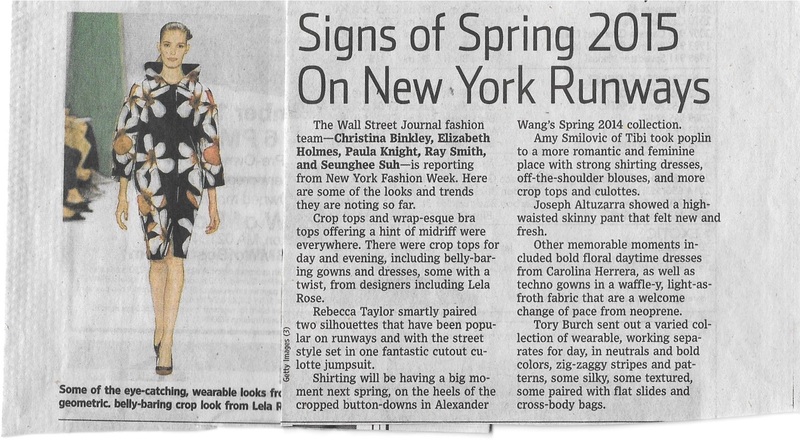 Not long after I purchased it, this small article on “Signs of Spring 2015 On New York Runways” appeared in the September 10, 2014 Wall Street Journal. 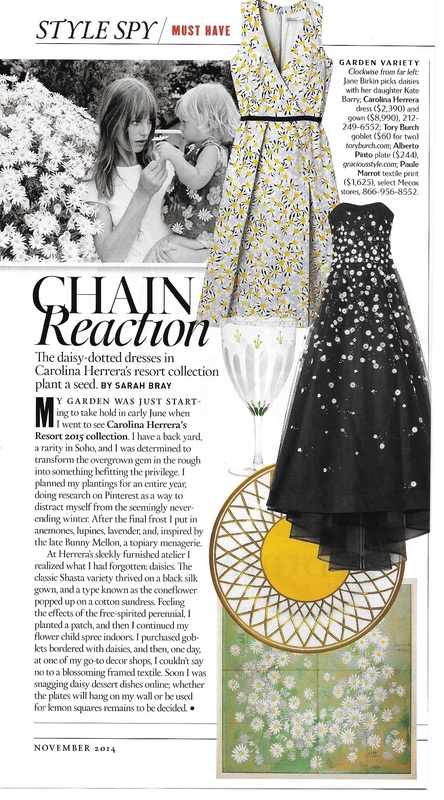 And then in November of 2014, more of Carolina Herrera’s Spring/Resort collection for 2015 was featured in Town & Country magazine. Perennial daises on two lovely Carolina Herrera dresses. Although I am of the mind that daisies are always in vogue, nevertheless, this seems like the perfect year to fashion a dress from this linen. Such a demonstrative print begs for a simply-styled dress, such as – you guessed it – a sheath dress. The fabric will make this dress, not the pattern. How could I, I wondered, do something a little different and still keep it simple? The answer to that question began to take shape when I found a length of pale lavender Moygashel linen this past Spring. Suddenly I envisioned a V-back to a sheath dress with a rounded neck, detailed with piping made from this lavender linen. Then it began to get complicated. 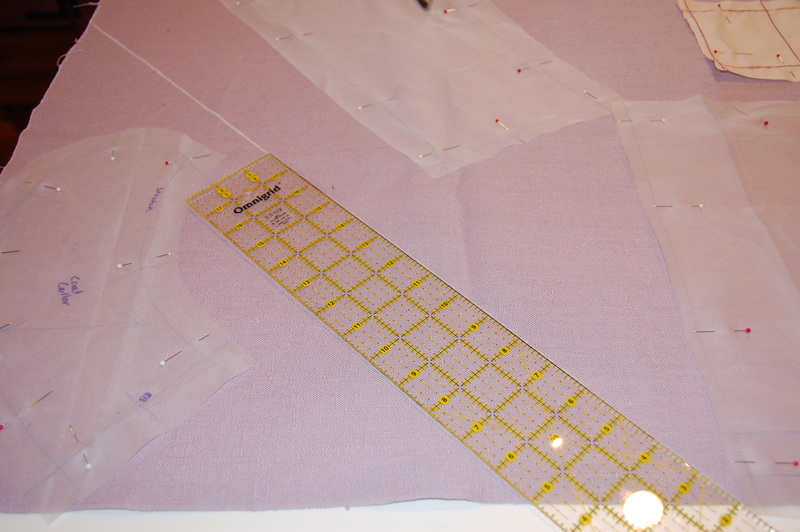 With just a few inches over 3 yards of the 35” wide lavender fabric, I knew I would have to calculate carefully when I cut bias strips for the piping, if I wanted to fashion another garment out of the lavender. And of course, I do! Actually, when I looked at the lavender fabric, and paired it with any number of my other fabrics and/or dresses, it seemed the only thing to use it for was a “Spring” coat. But would I have enough fabric for both a coat and bias strips for piping? The short version of the coat is on the left. The fact that it is featured with below elbow length sleeves and in a shorter version – perfect for pairing with coordinating dresses – worked in my favor. The entire coat has only 5 pattern pieces: front, back, collar, undercollar, and front facing. First I positioned the tissue pattern pieces on my fabric, strewn out on the floor selvedge to selvedge. 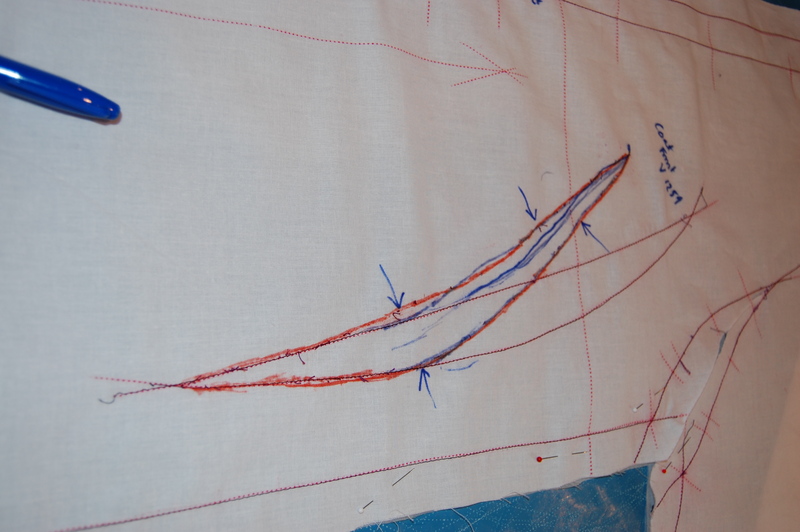 I was heartened enough by this exercise to go ahead and make a muslin, so I could have a “real” pattern to work from. All this time, the pink flowered daisy linen lay folded, awaiting her turn. One of the most unusual features of the coat design is the front dart, which serves both as a bust dart and as a side-shaping dart. As is so often the case with these vintage patterns, the dart sewn as indicated on the pattern was too high for me. In addition, it pulled and stretched the kimono shoulder in all the wrong ways. I lowered the apex of the dart and re-sewed it, trying to preserve its curve, and suddenly it fit like a charm. The newly drawn dart is in orange, while its original position is in red. Now that I had a workable pattern, I knew I could just eke out the coat if I “pieced” the left front facing. I could live with that! 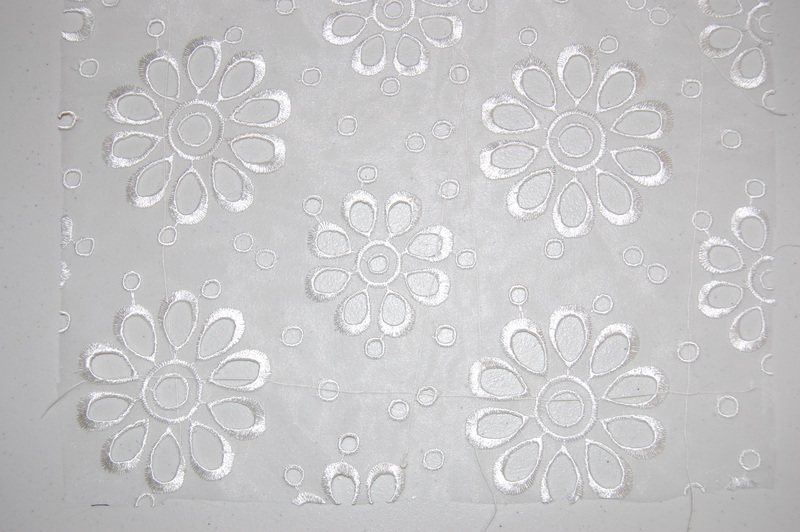 And, just as important, I would have enough of the fabric to cut bias strips for piping for my daisy sheath. Whew! This see-through ruler helped me find a corner from which to cut the bias strips for the piping. So now, the pieces for the coat, with their silk organza underlinings pinned in place, are taking their turn waiting for further attention. One project started another and now both are lined up like a circle of dominoes, ready to go down in an orderly fashion, albeit in slo-o-o-w motion. Ah, such is my sewing world – things don’t happen very quickly! However, your comment has me laughing! This looks like another sensational project. I am interested you have had to move the dart. I really look forward to seeing the next installment. Yes, those pesky darts always seem too high for me – it’s a common alteration for me when I use vintage patterns. But it’s a small price to pay for all the other glories of those older patterns! Beautiful fabrics and pattern selection. Can’t wait for the finished views. Thanks, Mary! Working with vintage Moygashel linen is a dream. Thanks, Mary Lynn! I’m hurrying, I’m hurrying…. Love the coat. I just binge watched the first season of the PBS drama Breathless, it was set in the 60’s and I was loving the coats the women wear. Your coat is the same style, very feminine and classic. 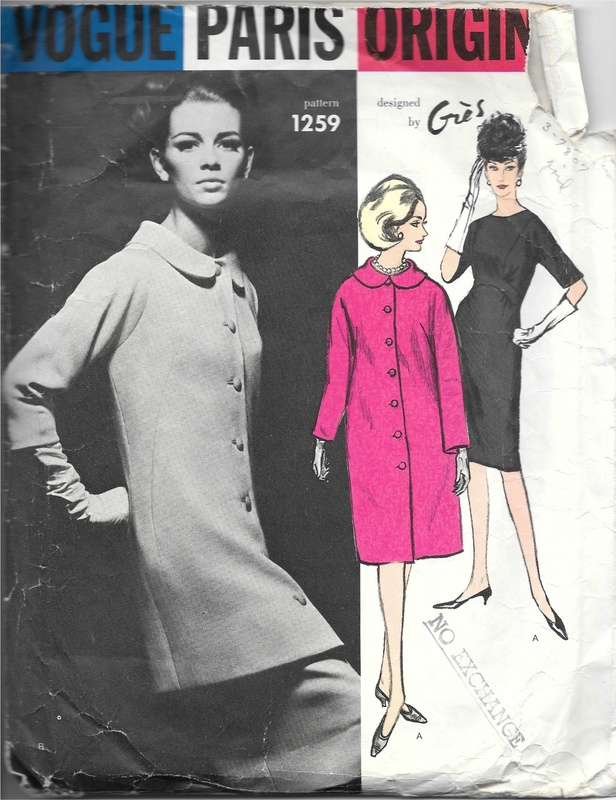 I am convinced there is nothing quite like the coats from the ’60s – I have so many vintage patterns from that era, and I’d love to make every coat pictured! I’ll have to see that PBS show. Don’t you love these shows that showcase fashions from that classic mid-century time period? I love flowery print, especially for summer! Count me in as another lover of 60s coats! I must have 40 coat patterns from that decade! I am so intrigued with your latest project and the way you calculated the fabric yardage. Plus that Moygashel is fantastic. Jeesh! 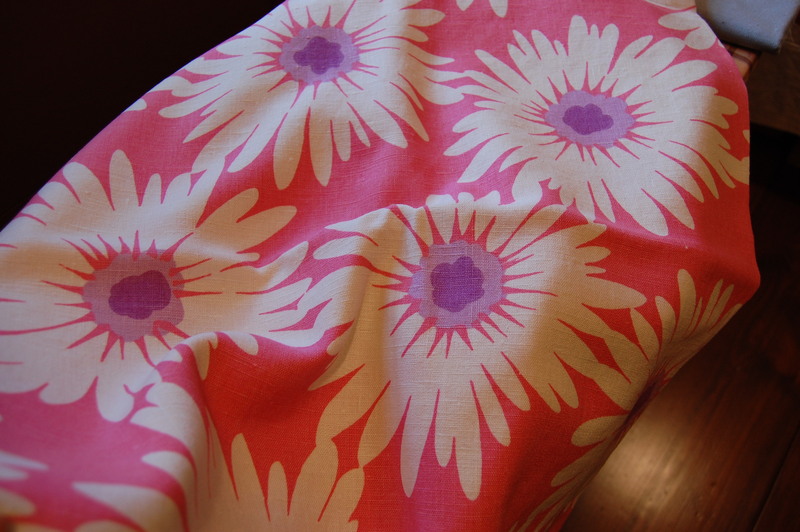 Vintage DVF fabric and now this beautiful linen…I’m drooling. I am always astounded at how you are able to fit yourself with excellent results. Amazing.